In New Mexico the Native Pueblo of Santo Domingo was named in honor of this saint and was the seat of the Inquisition during colonial times. Santo Domingo is the patron of the rosary and of astronomers. Born of wealthy Spanish nobility. His mother was Blessed Joan of Aza who, when pregnant, had a vision that her unborn child was a dog who would set the world on fire with a torch it carried in its mouth; a dog bearing a torch in its mouth became a symbol for the Dominicans. At his baptism, his mother saw a star shining from his chest. He studied theology at Palencia. Canon of the church of Osma. Priest. Augustinian. A lifelong apostolate among heretics, especially Albigensians, and especially in France; worked with Blessed Peter of Castelnau. Founded the Order of Friars Preachers (Dominicans) in 1215, a group who live a simple, austere life, and an order of nuns dedicated to the care of young girls. Visionary. Friend of St. Amata of Assisi. At one point Dominic became discouraged at the progress of his mission; the heresies remained. But he received a vision from Our Lady who showed him a wreath of roses, and told him to say the rosary daily, and teach it to all who would listen. Eventually the true faith won out. 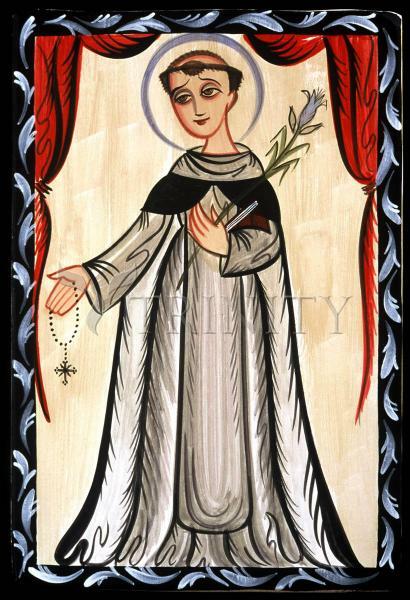 Dominic is often credited with the invention of the rosary, but it predates him. Legend says that Dominic received a vision of a beggar who, like Dominic, would do great things for the Faith. Dominic met the beggar the next day. He embraced him and said, "You are my companion and must walk with me. If we hold together, no earthly power can withstand us." The beggar was St. Francis of Assisi. Dominic possessed such great integrity and was so strongly motivated by divine love, that without a doubt he proved to be a bearer of honor and grace. And since a joyful heart animates the face, he displayed the peaceful composure of a spiritual man in the kindness he manifested outwardly and by the cheerfulness of his countenance. Wherever he went he showed himself in word and deed to be a man of the Gospel. During the day no one was more community-minded or pleasant toward his brothers and associates. During the night hours no one was more persistent in every kind of vigil and supplication. He seldom spoke unless it was with God, that is, in prayer, or about God; and in this matter he instructed his brothers. Frequently he made a special personal petition that God would deign to grant him genuine charity in caring for and obtaining the salvation of men. For he believed that only then would he be truly a member of Christ, when he had given himself totally for the salvation of men, just as the Lord Jesus, the Savior of all, had offered himself completely for our salvation. So, for this work, after a lengthy period of careful and provident planning, he founded the Orders of Friars Preachers. Two or three times he was chosen bishop, but he always refused, preferring to live with his brothers in poverty. Of him Pope Gregory IX declared: "I knew him as a steadfast follower of the apostolic way of life. There is no doubt that he is in heaven, sharing in the glory of the apostles themselves."